Over the last decade, exciting changes have transformed the pharmaceutical industry. For example, scientific advancements, particularly those that have contributed to the rise in biologics, are increasing the complexity of patient treatments and pharmaceutical products. In addition, many manufacturers are expanding their global footprints to address unmet patient needs in smaller populations across the world. With the amount of pharmaceuticals outpacing growth in overall air cargo by nearly a percentage point per year since 2008,2 expectations are mounting for innovative and sophisticated solutions that address the challenges with information flow across the air cargo supply chain. The following three technology trends could help mitigate airfreight logistics risks, reduce costs related to transportation issues and/or temperature excursions and, most importantly, help manufacturers deliver high-quality drugs safely and on time. The use of internet-enabled devices and technology in smart warehouses can improve operational efficiency by connecting devices and employees through an IT infrastructure linked to a warehouse management system (WMS).3 A WMS monitors and manages an unlimited range of data points using devices, sensors and radio frequency identification (RFID) tags. An RFID system includes readers that can read up to 200 RFID tags at once, with those tags storing up to 100 times the data of bar codes.4 Additionally, RFID tags are position-agnostic, facilitating scanning and increasing productivity, whereas bar codes must be oriented toward a scanner. With the advantage of speed these tools offer, an item can be tracked in real time, so a distribution manager can know a shipment’s exact location and its progress at any point throughout the supply chain. The knowledge and transparency of an IoT-enabled warehouse is also paving the way for further robotic automation. IoT-connected robotics are becoming more common, allowing robots to perform more complex tasks such as picking, packing and shipping.5 This limits the use of humans for mundane tasks and instead utilizes them where they are most valuable, reducing the cost of labor and training. Experts estimate nearly 70 percent of transactions in air cargo shipping could be automated using robotics or artificial intelligence (AI), cutting costs for stakeholders by up to $2 billion.6 Maintaining efficient and cost-effective operations is critical in any warehouse environment. Yet, this can be especially crucial during the storage and distribution of pharmaceuticals, where any excursions in temperature-sensitive products can compromise the efficacy and even safety of a product. By using robotics in the beginning phases of a distribution life cycle in combination with a fully faceted, temperature-controlled shipping container, a pharmaceutical manufacturer can have confidence its product is protected from its facility to the patient. Robotics can also improve employee safety. Sarcos Robotics, a developer of robotics and microelectromechanical systems, plans to introduce a powered exoskeleton suit in 2019 for warehouses and distribution centers. These “exosuits” are intended to reduce work-related injuries and problems associated with continuous lifting and moving of heavy items.7 According to the U.S. Bureau of Labor Statistics, workplace injuries and accidents cost U.S. employers more than $60 million annually, so technology such as this not only offers the productivity advantages of robotics but can also extend employee longevity. Just as with any information stored in blockchain’s decentralized, encrypted digital ledger system, these logs of critical transport data cannot be altered once they are entered. Customs and government authorities can use this ledger to easily see what the originating company and country was for a shipment and what its value is, so they can assess the appropriate tariffs. 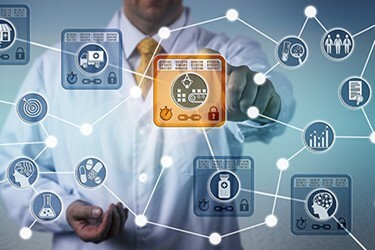 As pharmaceutical manufacturers begin or even continue, to expand their global footprint, using blockchain technology to track their shipments is seen as an invaluable tool in global trade. The data extracted from AI software can provide the information needed to foresee potential issues and make recommendations or decisions on optimal actions.17 Data sets about inventory, supplier performance, demand fluctuations and even conditions along a route, such as weather, road or customs delays, can be used to plan ahead and/or take action in real time, facilitating decision making and increasing speed. The ability to apply predictive analytics to the pharmaceutical supply chain offers end-to-end visibility never before possible but incredibly crucial in an industry that is responsible for not only developing high-value products but also— and more importantly—millions of lives. An example of the power of combining artificial intelligence and predictive analytics is the machine learning platform PAI 2, developed by the cloud computing company Alibaba Cloud. PAI 2 allows customers “to collect information, discern patterns in data and adapt to new input without explicit programming.”18 An example of PAI 2’s capabilities is its ability to learn and predict airfreight shipping each day for supply chain operators while taking into consideration factors like weather patterns along the intended route.19 Customer expectations can be maintained appropriately in real time by adjusting delivery dates as unexpected weather creates delays. The algorithms possible with AI software are also able to predict other types of patterns, such as future buying habits, letting shippers better forecast when and where resources need to be diverted, as well as potential issues related to customs/borders. Manufacturers investing billions of dollars in lifesaving drug products must be able to rely on supply chain stakeholders to deliver these high-value packages on time and within specifications. As you consider the best way to ship your valuable pharmaceutical products, consider these tools as ways to preserve the quality of your product and protect the safety of patients. Not only is this necessary for a healthy bottom line but also to meet the wide range of needs and expectations of today’s patient population.